Spirit is not worried. Your Soul is not worried. It knows the perfection. The most effective meditation I have ever seen is worrying. Unfortunately, it goes the wrong way, and I have not seen too many changes made because of worrying. But I know that holding a positive focus on what you want and taking continual small steps towards it is the way to bring it about. Whichever model one uses it certainly appears that we have chosen to be in a time of immense change. Readers of this blog will know that my personal opinion is the extent of these changes will be made abundantly clear within the next 5-7 years. It is likely that these changes will come in surges—it will be peaceful and a quiet, a lull, and then a sudden unexpected surge. I have also outlined the nine challenges we will be facing. My metaphor has been the ancient game of Go and in that metaphor that we have entered the Middle Game, the most active and dynamic phase of the game. 1) Get your affairs in order as best you can. Pay off as much debt as you can, save a little, use good money management, own a few gold coins, and be frugal. If you own property that is a plus and if you have a garden start experimenting with growing your own food as much as is practical. 2) Be as healthy as you can. If nothing else, walk a few minutes a day. Move your body. It is the best thing you can do for your health and it doesn’t cost anything. 3) Follow the spiritual principles of abundance and prosperity. They will keep you close to God. They involve giving and gratitude, and grace. Joyful Givers consistently report miracles of protection. 4) Start developing a community of people in whom you can trust. Being trustworthy is going to be one of the biggest assets a person can have. With the above in place start to develop desired positive outcomes and create ideal scenes, know what is most important to you, and develop a positive internal dialog. Do NOT lose in any kind of fantasy you create. Understand that service will be the only game in town. You’ll be serving someone. If I were to sum up the purpose of this blog it would be: Be Prepared; Live Well. Living well is following the spiritual principles of abundance and prosperity and of course staying healthy. It is difficult for me to imagine truly living well without a spiritual focus coming first in life. Being prepared is what I have been mainly posting about recently. We are in a time of enormous change. It will take us a generation to absorb it all and adjust and so we adopt a new mentality that isn’t based on consumerism and consumption and winning at all costs. That mentality is mostly absent from our current leaders. I do believe that Obama gets it, but he is dealing with financial system and a congress and senate and state legislatures that are more partisan, divisive, corrupt, and just plain stupid as they have ever been. In simple terms they all need to move on—retire or die, so a new leadership can take place. And that takes years not months. The above should be of no surprise. Several years ago I was on my way to Nigeria and I asked John-Roger whether he had anything for the MSIAers there that I could pass on. He asked me to pass on his love to them. He then said to tell them that most people say that power corrupts. J-R said that it wasn’t true. It was that corrupt people sought power. There is a lot to be grateful for, blessings abound, and this is a very rich time of growth and learning. The milennial generation (born 1980-2003), many are in their twenties and are very technologically savvy having grown up with computers. They are very connected, and consensus based and much less partisan than prior generations. (They are also spoiled and floaty, but that is another matter). I’ll have more to say tomorrow, but meanwhile read this NY Times article from Tom Friedman. There is a lot to be optimistic and hopeful about. It is a little idealistic, but I think a little idealism is healthy particularly when the reality is that humanity has all the resources it needs. I am no financial genius. Quite the contrary. I believe in working for a living and not having expenses exceed what is earned. If money is borrowed then the use of that money should earn more than the cost of borrowing it as well as generating the money to be able to repay the loan. As you can see with this philosophy I have been entirely out of kilter with the economy for most of my adult life. I have never really got how a consumer society could be sustained and how increasing amounts of leverage can be applied ad infinitum. Each time I thought the economy was going to collapse, property values went higher and the stock market went to new highs. I thought I was going crazy as I experienced a mismatch between my personal values and what I knew to be sustainable, and what was actually going on. Friends and acquaintances achieved wealth that I couldn’t imagine with relative ease. I felt left out and a little stupid. Give the above you can imagine that the current financial insanity is to me a return to saner times. Things now make sense again and I feel in tune with the times for the first time in over 30 years. That’s why I know that this stimulus package is doomed to fail. It may have short term benefits but how can you possibly cure financial irresponsibility with even more ramped financial irresponsibility? How can you cure a drug addict with more drugs--unless of course you are trying to kill them? And how is this debt going to get paid off? With whose money? It's going to be a long and winding road involving economics, geopolitics, the environment, and social factors. But at least I feel sane for the first time in years. It really is a great time to be alive. When I started this blog, I had no idea that I would be writing so much about the economy. I felt, and still do feel, that it would be silly to be talking about the principles of abundance and prosperity and ignore what was going on around us and very much affecting our financial lives, directly or indirectly. The irony of course is that the spiritual principles of abundance and prosperity have very little to do with money. Money is a functional illusion, and many times a dysfunctional one. The spiritual principles endure regardless of currency or Government. And it is the spiritual principles that we must turn to again and again as we face the current situation. For those of us who live in Southern California we know that a big earthquake is imminent. Not the Northridge one that took down the roof of Prana and part of a freeway. That was 4 seconds. But a larger one that lasts over a minute or minutes. We don’t know how long or how big or where we will be or how it will affect us, we just know it is coming. And so we prepare as best as we can. We are drilled in what to do and what supplies to have on hand. And it is not negative to talk about being prepared. We are in the midst of a financial meltdown/earthquake. The extent of it is still unknown. The leaders charged with handling it are clueless, and I really mean clueless, on how to handle it effectively. The only thing that they can be depended on to do is protect, and in some cases further, their own self-interest. No one knows where this is going, except that it is going to get much worse. So, we need to be prepared. I have blogged about this before and I will be blogging about it again this week. This crisis is on a global scale and it will not be going away for many years. In terms of the world it will define how we live in the future and a lot of good will come out of it. By the way, if you thought I was being a little cynical above check out the interview between Bill Moyers and Simon Johnston that took place on Friday. The link is below. There is a transcript with the link if you prefer to read it. BILL MOYERS: Geithner has hired as his chief-of-staff, the lobbyist from Goldman Sachs. The new deputy secretary of state was, until last year, a CEO of Citigroup. Another CFO from Citigroup is now assistant to the president, and deputy national security advisor for International Economic Affairs. And one of his deputies also came from Citigroup. One new member of the president's Economic Recovery Advisory Board comes from UBS, which is being investigated for helping rich clients evade taxes. I mean, is that what you're talking about with this web of relationships? SIMON JOHNSON: And that's exactly the right way to think about it. That web of interest is not my interest, or your interest, or the interest of the taxpayer. It's the interest, first and foremost, of the financial industry in this country. BILL MOYERS: I mean, when I watched the eight CEOs testify before Congress at the House Financial Services Committee earlier this week, I had just finished reading a report that almost every member of that Committee had received contributions from those banks last year. I mean in a way that's like paying the cop on the beat not to arrest you, right? SIMON JOHNSON: It a massive problem, obviously. These people are throughout the system of government. They are very much at the forefront of the Treasury. The Treasury is apparently calling the shots on their economic policies. This is a decisive moment. Either you break the power or we're stuck for a long time with this arrangement. For the last few weeks I have, from time to time, spoken about the change that is coming. That we have crossed a generational line. In Fourth Turning terms, we have completed the “Unraveling” and we are now in the “Crisis” era that will last a generation (20-25 years). Of course the problem with expressing these kind of things is that I have not only sounded negative but also like a raving maniac. None of which, of course, was my intention. I am glad to report that in the last day or so two items have come to my attention that I think every reader of this blog should see and read. It expresses the ideas I have mentioned above in far more articulate and relatable terms than I have been able to muster. Despite decades of affluence, longstanding issues like health care, education, energy and entitlement debt have not been adequately addressed. The baby boomers, who entered adulthood promising a lifetime of activism, have been a politically undistinguished generation. They produced two presidents, neither of whom lived up to his potential. They remained consumed by the culture war that divided their generation. They pass their political supremacy today having squandered the fat years and the golden opportunities. And for a hint at what this new generation looks like and is up to, go here and watch this four minute video. Regardless of our new President-elect’s statement about representing change, change was already on the cards and in motion. It has been this blog’s view that we need to be prepared for this change, which will be of a magnitude we have not experienced before, and that following the spiritual principles of abundance and prosperity are going to assist us a lot in maintaining our balance and being of service in this new era we have just entered. Empathy is a saving grace. You will, through empathy, have the freedom to stand and lovingly face the conditioning that is not only yours but is in the world. Laughter is an expression of empathy. Tears are also an expression of empathy. When you understand empathy, you move into the consciousness of “You are one with me. We are walking in each others’ shoes.” And it becomes a really great, great day. 1) What I’ve been trying to say in this blog is that the outer game has changed. This is the game of the world. We have had a fantastic run, a wild party if you will, and now the party is over, the DJ has gone home and the tidying up begins. And it is going to be a long cycle of tidying up. The inner game, however, remains the same. This is the why we are in MSIA to discover the nature of the soul, live in it as best we can, and transcend it. So while the tidying up goes on we can be joyful, ecstatic even, empathetic, and, increasingly, of service. Since I was constantly confronted with “go look it up!” when I wondered what something meant as a child, I hit up the trusty dictionary first. The definition that applied there said, “a fall in the general price level or a contraction of credit and available money”. But what about the fall in the general price level portion? What would that mean to me? On the surface it seems like it might be a good thing. (Great! I can spend less money to buy the stuff I need!) But when you dig deeper, there are other effects. Housing prices drop, and people can’t move without taking a loss. (Which is fine if you don’t need to move, but not so fine if you do.) Businesses get less for their products and services, which means they are less profitable, which means they start laying people off. People who do remain employed might not get raises or might take pay cuts, which is unpleasant. People who are in debt struggle even more to stay afloat. In general, people spend less, which creates a vicious cycle. I hate to be an advocate for wanton spending; I don’t think that’s good either by any means, but it would be nice if we (and the economy) could find some middle ground where things are satisfactory and reasonable. The American League champions, who face the Philadelphia Phillies for the title, tied for the second-most regular-season Major League Baseball wins and slugged their way past the Chicago White Sox and Boston Red Sox with 22 playoff home runs, all with the second-smallest payroll of the league's 30 franchises. Many years ago I was a piano major at Oberlin Conservatory. I was a very good student; not outstanding, but very good. And I very much wanted to study with one teacher who was undoubtedly the best. He'd take ordinary students and turn them into fabulous pianists. Finally I got my chance. He taught with two pianos. He didn't even say hello. He just sat down at his piano and played five notes, and then he said, "You do it." I was supposed to play it just the way he played it. I played it—and he said, "No." He played it again, and I played it again. And he said, "No." We had an hour of that, and each time he said NO. In the next three months I played about three measures, perhaps half a minute of music. Now I had thought I was pretty good; I'd played soloist with little symphony orchestras. Yet we did this for three months, and I cried most of those three months. He had all of the marks of a real teacher, that tremendous drive and determination to make the student see. That's why he was so good. And at the end of three months, one day, he said, "Good." What had happened? Finally, I had learned to listen. And as he said, if you can hear it, you can play it. As long as you believe in and give power to the illusions of this world, you will get caught up in them. This isn't bad; it may be that the cause and effect with which you are dealing is going to hold you into the earth plane for a few more lessons, for a few more experiences. Love them. The key to breaking free is to love yourself and to love each experience that comes to you whether it appears to be negative or positive. Love it all equally. A boat with even a small leak is going to sink. You, on the other hand, don't need to be perfect to succeed. Imagine that you have a 4 x 4 grid to fill with assets. If it's a business, it might be location, reputation, staff, offerings that are in high demand and a sector that's robust... if you're doing it for yourself, it might include your resume, your network, your skill set, etc. When someone chooses you or your products, they're considering everything you have to offer. Whether you're looking for a job or trying to make a sale, there is rarely only one thing that makes the difference. The problem with whining is this: human beings like to be right. If you persuade yourself and your friends that times are really tough and that you're bound to fail, you'll probably do the things you need to do to make that true in the long run. This excellent graphic is a great overview of the financial condition of the U.S. since 1920. There is a lot of good information in it. I expect the graph to now go parabolic, i.e. vertical, as the U.S. government enters into a massive spending binge. “The first interview was with an elderly man whose job was to make lox sandwiches in a Manhattan deli. He spent his entire day slicing salmon—that was the extent of the challenges he encountered at work. One might have expected him to have found his task boring, but he discussed it with the enthusiasm of a poet or a surgeon. Instead, we’ve been hearing for most of the past year about “systemic risk”—the notion that allowing one firm to fail will cause a cascade that will take down other healthy companies in its wake. Ms. Schwartz doesn’t buy it. “The [government] doesn’t have to save them, just at it didn’t save the stockholders and the employees of Bear Stearns. Creditors are no more worthy of being rescued than ordinary people, who are really innocent of what’s been going on.” It takes real guts to let a large, powerful institution go down. But the alternative—the current credit freeze—is worse, Ms Schwartz argues. Well said, and that is the reason that the whole world financial system has undergone a seismic shift. When principles are compromised, trust is lost as the foundation has disappeared. More on trust in upcoming posts. Two beggars are sitting on the pavement in Ireland. One is holding a large cross and the other a large star of David. Both are holding hats to collect contributions. As people walk by, they lift their noses at the guy holding the star of David but drop money in the other guy’s hat. Soon one hat is nearly full whilst the other hat is empty. A priest watches and then approaches the men. He turns to the guy with the Star of David and says, "Don't you realize that this is a Christian country? You'll never get any contributions in this country holding a Star of David." The guy holding the Star of David then turns to the guy holding the Cross and says, "Hymie, look who's trying to teach us Marketing." For months I've insisted that no nation can run an empire and fight two wars on borrowed money. Sooner or later something has to give -- the nation's credit standing or its currency. Now the dreaded subject is beginning to emerge. The demise of the US's world standing. Today, in The Wall Street Journal of all places, we see a featured piece on the op-ed page entitled, "The Dangers of a Diminished America." A diminished America? How can that be? It be. The US has been getting away with it all by owning the unique advantage of printing the very money that its huge debt is denominated in. Yes, I'm talking about the reserve status of the US dollar. This is the Achilles Heel of the US. The US dollar will possess its reserve status as long as our creditors continue to accept Federal Reserve Notes, paper with nothing behind it accept the "full faith and credit" of the United States. Which is why we hold gold. Gold needs no faith and credit of any nation behind it. Gold cannot be ground out by any central bank. Gold represents pure wealth, and it has before Biblical times. Nobody has ever challenged the intrinsic value of gold. Sometime in the future the world will challenge the worth of all fiat money. Fiat money is money because a government decrees by fiat that "this is money." Is that logical? Every fiat issue of money has been destroyed going back in history. This is on the heels of expanding in the midst of contraction and is exemplified in this great lesson from venture capitalist Paul Graham (excerpts below). So whether in this new environment you get awesome dividend returns on your stocks, or you start up a new company, or you use this time to clean up your act, there is opportunity for learning and growth everywhere. So be relaxed and aware and have your eyes open. As those examples suggest, a recession may not be such a bad time to start a startup. I'm not claiming it's a particularly good time either. The truth is more boring: the state of the economy doesn't matter much either way. If we've learned one thing from funding so many startups, it's that they succeed or fail based on the qualities of the founders. The economy has some effect, certainly, but as a predictor of success it's rounding error compared to the founders. Which means that what matters is who you are, not when you do it. If you're the right sort of person, you'll win even in a bad economy. And if you're not, a good economy won't save you. Someone who thinks "I better not start a startup now, because the economy is so bad" is making the same mistake as the people who thought during the Bubble "all I have to do is start a startup, and I'll be rich." So if you want to improve your chances, you should think far more about who you can recruit as a cofounder than the state of the economy. And if you're worried about threats to the survival of your company, don't look for them in the news. Look in the mirror. Q: How can I continually expand to hold the spiritual energy? A: Laugh and smile in the midst of contraction. Be more bold–not in terms of risking, but more bold in terms of trusting yourself, trusting more to the Lord, and following the Inner Traveler guidance, not your emotional feelings about things. Here is a quick re-cap for new readers (greater detail covered in past posts see Getting Ready tag on right side of blog). b) We are in the midst of some important large generational cycles. 2) It is my opinion that the next 20 years are going to be enormously challenging at a national, global, and planetary level. How it is handled at a personal level depends on many factors, but we can be inwardly and outwardly prepared. 3) Practicing the spiritual principles of abundance and prosperity gives us a great opportunity to grow personally and spiritually during this upcoming period. 7) This is a daily blog and each weekday I like to include a Smile of the Day and a Financial Quote of the Day. Hope that brings you up to date. You have to go here but it is well worth it. No. 14 is my favorite. Q: Do you think we will learn anything from all of this turmoil? A: We will learn an enormous amount in a very short time, quite a bit in the medium term and absolutely nothing in the long term. That would be the historical precedent. Q: Where do you see all of this going? A: I want to emphasize how little I understand all of the intricate workings of the global financial system. I hope that someone else gets it, because I don’t. And I have no idea, really, how this will work out. I certainly wish it hadn’t happened. It is just so intricate that all I can conclude, by instinct and by reading the history books, is that it will be longer, harder and more complicated than we expect. Our bodies build their form around the energy we place out. If we misuse our energy by putting our attention in the wrong place, the body will build its form around it. For example, if you worry a lot, it will be reflected in your tense shoulders and your tight stomach. When we start to use our energy correctly, our shoulders loosen, the stomach relaxes, the energy starts moving into the areas that have been blocked or closed off, and the body starts aligning itself spontaneously. Correct use of energy makes everything liquid, relaxed, and smooth. The body will line itself up and re-form itself according to your conscious thought and pattern of behavior. The lesson is that if we don’t change our behavior, the body will go back to its previous condition. If we are willing to listen and watch, we’ll find that the body is not only educating us in how to get well but also showing us how to change the condition that produced the sense of imbalance or illness. In life there are factors we cannot control and to a certain extent that is true of our bodies. We have genetic factors at work, and the environment we live in or were raised in, and of course our karma. However, we do our best with what we’ve got and there are things we can do to enhance our health. Why I am talking about it here? Because health expenses are a major part of our budgets and if we can keep them down, without depriving ourselves of care, we will be in better financial shape. In simple terms, health revolves around three areas: movement (exercise), nutrition (food), and rest (sleep). We have control over all three areas to a large extent. All three when properly applied reduce stress, and help us renew. See if you can a small thing to improve each area. The benefits will be both short-term and long-term, on your well-being and on your pocket book. So ... I’ve been buying American stocks. Why? A simple rule dictates my buying: Be fearful when others are greedy, and be greedy when others are fearful. And most certainly, fear is now widespread, gripping even seasoned investors. Fears regarding the long-term prosperity of the nation’s many sound companies make no sense. These businesses will indeed suffer earnings hiccups, as they always have. But most major companies will be setting new profit records 5, 10 and 20 years from now. Equities will almost certainly outperform cash over the next decade, probably by a substantial degree. Those investors who cling now to cash are betting they can efficiently time their move away from it later. We are all of God. There is nothing and no one that is not of God. The spark of God individualized within human beings is the Soul. The Soul is the basic element of our existence. The Soul is forever connected to God. That connection is perfect and intimate; it is the source from which we draw our life. The nature, the essence, of the Soul is JOY. It is joyful because it is wholly of God, is aware of that, and has total knowledge of that. As readers of this blog know, it is my personal opinion, for reasons that I have outlined as clearly as I can, that this next 20 year period will be replete with challenges the nature of which has not been seen in many decades, at both a national, international, and planetary level. The personal level, how we respond to all this, is up to us. The MSIA teaching is clear—use EVERYTHING for your upliftment, learning, and growth. (My caps). Therefore I am looking down two tracks as we approach the coming 20 years. The first is an inner one, where we are inwardly prepared for what is to take place. The second is an outer one--what we can do in our worlds to cope and benefit from what is to come. We will be doing this from the perspective of living the spiritual principles of abundance and prosperity. This perspective is ideal because it has a large spiritual component while also embracing a large practical and worldly one. Keep the quote at the beginning of this post as inspiration and remember that someone truly following the spiritual principles of abundance and prosperity IS a JOYFUL giver. No one reading this lacks for joy. So it is important to access it, fill yourself with it, and let it flow over to others. It’s always possible, of course, that some bit of good and unexpected economic news is just around the corner. The situation also seemed pretty dire in the mid-1990s, until the Internet boom came along and incomes then started rising at their fastest pace since the 1960s. But you would have to be a pretty zealous optimist to forecast a repeat of that story. For two decades, consumer spending has been an enormous driver of economic growth, thanks in good measure to a long bull market, a housing bubble and a boom in consumer debt. The bull market, the housing bubble and the debt boom have all ended — and now paychecks are shrinking, too. At some point, the next big economic engine will indeed arrive. It always does. This time, however, it’s going to have some stiff head winds to overcome. Tomorrow we'll look at Outer Lesson Two. Okay, what have we learned from this financial crisis? The government has chosen to spend its way out of the mess, which is a luxury that most of the people reading this blog don’t have. I’m not saying retail therapy doesn’t work, it is wonderful and blessed relief, it just doesn’t seem to have a long-term positive effect, particularly if you are broke. I have read and heard that people have identified the root of the financial crisis as greed. I don’t buy it. Greed has always been part of the human condition. It’s a basic survival instinct. Not up there on the scale of higher vibrations, but nevertheless part of all of us. As I have written at length, it is the times, the cycles, and the generations, that were the fertile soil in which the greed could flourish. But enough of that. Let’s learn the lessons and start to move into preparation mode. Outer Lesson One: Live within your means. Do not follow the government’s example. In fact, ironically, it will be the law and the government that will come knocking if you do not fulfill your responsibilities to this level. Inner Preparation One: Maintain your sense of humor, no matter what. The Torah says, “Love thy neighbor as thy self.” The Buddha says there is no “self.” So maybe you are off the hook. Perhaps you can start to prepare your own list of lessons you can apply, together with inner preparation tools, that will get you in shape to meet the next 20 years. The basic principle of abundance is that you tithe on the “first fruits of the harvest.” If you’re not, then you are thwarting yourself of receiving the abundance that comes from tithing. Some people say, “I don’t have enough money to meet my bills, let alone tithe.” That may be very true, and it may be like that all their life because they do not have God as their partner. They have themselves as a selfish partner. Shelley and I are just back from seeing Suspended Animation a live show by Phillip Huber Marionettes. After seeing Being John Malkovich in 1999, the opening scene has stuck with me all these years later. When I found it on YouTube, one of the comments mentioned that the puppeteer was Phillip Huber. 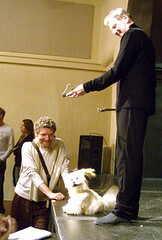 As luck would have it he made a very rare appearance in Santa Monica, as part of the Puppet Festival, this weekend. The theater and audience was small and after his superlative performance he came out and chatted and showed us the puppets. Needless to say I couldn’t wipe the grin off my face. An intimate moment with one of the finest puppeteers in the world--wow. I started out this series of Getting Ready posts with the idea of giving the present financial crisis some context. I hope the one thing you got out of it is that it is not an isolated event. None of us need to feel a victim of it, anymore than we need to feel a victim of being cold in winter. We know it is going to be cold so we prepare. We heat our home if we can afford to, or in Shelley and my case, we wear increasing layers of clothes as it gets colder in order to survive in our loft. In a similar way we can look out and see that we are heading into a different time and a different mood than has prevailed for the past 25 years or so. It’s easy to point fingers and blame, however each generation corrects the excesses of the previous one, and so the balancing act of life and society goes on. Once we know that we are in a cycle, we accept it, and prepare ourselves to receive it along the opportunities, both inwardly and outwardly, that it offers. The Dow topped out in early-September 1929. On November 1954, 25 years later, the high was exceeded. Gold hit a high of in 1980. In January 2008, after 28 years of decline and lying dormant, gold bettered its old 1980 high. So when will the Dow better its high of October 2007? Your guess is as good as mine, but if history is any indication, it may be a while. And then of course there is the issue that no candidate of politician wishes to address—how are we going to pay for Social Security and Medicare as the boomers retire? One choice for the Government is to borrow the money. But that involves payment of large amounts of interest. The far easier choice, and the most likely, is to print the money. Unlike you or I the U.S. government doesn’t have to earn money, they can just ratchet up the printing presses, and voila—money! The consequence of such an approach may help the government pay off its debt but it doesn’t help you and me. I mean by that that the consequence is likely to be rampant inflation. It is therefore no accident that people are loading up on gold coins and thus they are in short supply. Gold protects against inflation and the decline of paper currencies. Gold doesn’t earn interest and its price fluctuates wildly with people’s emotions and it can be manipulated for a while, but it has stood the test of time since it was first discovered. So one way to be prepared is to own a little gold and to have some cash on hand. However, very best way to be prepared is inwardly. One of the great gestures we can make to show our faith that God comes first in our lives, is to tithe. This week my posts will be about looking at the opportunities in the next 20 years. Plus I will be letting you know my list of things I am personally doing to prepare for this period—inwardly and outwardly. The idea is not for you to buy into my approach, but to stimulate you into making one for yourself. Our life reveals to us what we have to learn next—not to reveal our failure to us, but to reveal to us where we lacked preparation, where we really weren’t thoroughly up on what was going on. So realize that there are valuable lessons to be learned from and in the “games” of the world—and if you were not still in the process of learning and growing, you would no longer be here in a physical body. The Fourth Turning is where we enter into what Strauss and Howe call a Crisis. Yes, I know it sounds rather foreboding, but there is a very positive side to it. Well, frankly, it’s a stretch to find the positive, but it is there if we look very closely, ignore reality, hold our breath, and read our discourses and nothing else. In a Fourth Turning, institutional life is torn down and re-built from the ground up. This is done almost always in response to a perceived threat to a nation’s survival. In the past, if history doesn’t produce a threat, some leader in a Fourth Turning will find one or create one in order to mobilize collective action. Cyclically, this is what happens after the Third Turning. In this time of Crisis people tend towards becoming part of a group action (dropping the individualism that had dominated the two prior turnings), communities come together and find a greater purpose, families become more important in the culture, and family life returns to the center of people’s lives. Trust in Civic authority revives and very often a Fourth Turning involves a new founding moment in the nation’s history as people re-define their national identity. Are we coming up into a Fourth Turning? I would say yes. In my own opinion the financial crisis was closure on the Third Turning (Unraveling), and we are entering the doorway to the Fouth Turning. What does this all mean? Well, I like to answer, “Lots of service opportunities.” And for sure for those of us who stay healthy and live the spiritual principles of abundance and prosperity, there will be. A crisis can come in many forms, we are seeing one of them now in the financial area. We have the possibilities of wars, ecological catastrophe, earthquakes, and more financial crises. Am I being a gloom and doomer here? Well it certainly looks like it but that is not my intent. It’s important to prepare for the worst and hope for the best, and as J-R says, “shoot down the middle.” The reason that many people are having difficulty now, is that they didn’t prepare. How long is this going to last? In generational cycle terms, about 20-25 years. That means that if the Fourth Turning has started it will last until approximately 2025. It’s not all downhill, there will be plenty of up moments, and with the right attitude the whole period can be an up moment. Listening to J-R over the years, and attempting to get a handle on his various predictions over a long period, I would say that he has pointed to the period between 2012 and 2020 as being particularly challenging. So what can we do? Plenty. And will be exploring that in future posts. Meanwhile, stay optimistic and the one thing not to do buy into, or create, is fear. As Hamlet says "The readiness is all." This physical level is the most insecure, the most doubt-ridden, and the most frustrating level, but that’s because it is the classroom. The earth is one of those places where the Soul can get the most experience in the shortest period of time, so it chooses to come here as often as is necessary for the correct and useful experiences and to clean up incompletes from past existences. The Soul needs these experiences so it will know how to be an effective and efficient creator. So in this generational model, we are following a natural cycle of events. For example in the uber-big picture, global warming is followed by a global freezing which then creates the foundation for a next warming. Of course, this takes place over millions of years. The generational model is more accessible and useful to us. Please understand that I am trying to put things together so we can come to a greater understanding and clarity and ride this next period of time out in a graceful way, placing God first. As we live the spiritual principals of abundance and prosperity it is pointless to put on blinkers and ignore what is going on, anymore than it is to cross the road with our eyes closed because God is our Partner. So let’s look at all this with awareness and openness and, of course, knowing that it is all perfect. Anne, commenting on Wednesday's post, wrote: “I may be crazy, but what I am hearing in me is that what is going on in the world just now is a ‘storm in a tea cup.’” In the context that this life is just a blink in the eye of God, you are absolutely correct. Meanwhile back on Planet Earth, yes, you are crazy. The world financial system is literally on the point of imploding, and though I have no doubt it will right itself, it is not without immense consequences, which I will be going into and which is actually is a good segue into what follows the Unraveling--the Fourth Turning. We’ll look at that tomorrow. Your job on this planet is rather well laid out for you. It is to keep your attitude, your consciousness, in a favorable condition for your self-growth. And much of your ability to open to new things, to be able to incorporate new ideas into your life, to change your patterns of behavior, and to grow depends on your attitude towards the situations in which you find yourself. If you can keep a positive attitude, you can learn from any situation. You can continually grow and lift in consciousness, and life can be a beautiful experience. In 1997, William Strauss and Neil Howe wrote a book called The Fourth Turning. It followed their 1993 book called Generations. It is in their analysis of Generations that we find a very interesting context to place the times in which we are living. Strauss and Howe go back to the mid-1400’s to track their generational cycles. That level of depth is outside our mission, which is to relate and elucidate the spiritual principles of abundance and prosperity. If you are interested in exploring history you can go here. The generation that you are undoubtedly most familiar with are known as the Baby Boomers. They are commonly thought to have been born between 1946 to 1964--although Strauss and Howe (S&H) place them between 1943 and 1960. Each generation has their role and their place in time. The boomers came of age in a period of great revolution in consciousness. S&H refer to this period as an Awakening. It is one of the many awakenings that have taken place in the past few hundred years. The Awakening period, in the generational cycle model, follows a period call a High. A High is characterized by strong institutions and where society is confident about where it wants to go, however, the individual is weak. An example of this is the U.S. after World War II. The country was feeling greater than the sum of its parts and there was a great trust in big institutions. Of course, it was against this backdrop that the boomers rebelled. As society was reaching its peak, in a material sense, institutions were attacked as people craved higher values, more personal and spiritual autonomy, and a desire to regain some sense of personal authenticity. Hence this Awakening, also called the Second Turning, from the mid-60’s to the early 80’s, was the time when boomers were coming of age--a creative throwing off of social and political obligations through campus revolts, tax revolts, cultural revolts, and various other revolts. In this environment, gradually, the individual returned to prominence. According to S&H, the period from 1983 to the present time is called the Third Turning, also known as the Unraveling. I think you can see where I am going here. More tomorrow. We say to you that this land that is reflected is not a land that can be defended nor attacked, for it is merely the schoolroom in which we come forward to partake of the teachings and to observe the testing as a delineator for future progress. John-Roger provided me with a spiritual context into which I could fit my life and into which I found found purpose and direction. I am presently learning the game of Go. My sensei (teacher) is Ron Beimel, who also happens to be the technical wizard behind this website. It has taken me months to get my head around this game and only just recently has it begun, even remotely, to make sense. It has taken me a while to understand the context in which the moves are made. Not necessary for most, but essential for me to understand in order for me to move forward. All of which brings us to the world events taking place at this time. What the on earth is going on? What is the context for all this change? After all things were going swimmingly for so many years. Sure there were ups and downs, but it was relatively stable. Then we had the dot.com bust, followed by 9/11, followed by Katrina, the Iraq debacle, egregious human rights violations by this country, and now the present financial collapse. The President has one of the lowest popularity ratings in history, and Congress is at he lowest. One by one our trust in the things we held dear—security, stability, human rights, capitalism, and our own political system, are being eroded and in some cases even derided. The first, and most important, context for me is that this world is a classroom, a school. We come here to learn. And learning isn’t comfortable. After all what’s the point in learning what we already know? And Earth has been so brilliantly constructed that we get to learn whether we want to or not, positively or negatively. Of course most of us are slow learners. When someone told me that J-R had said they were an old soul, I jokingly replied, “That’s nothing to be proud of!” The people who have really learned are no longer here, or are here to teach us. Boy, are we slow learners. Look as far back as history goes—we are doing the same things, over and over. It’s that “over and over” that I want to address in the next few posts because the second context that has helped me is the nature of cycles. It is cyclical nature of things that has provided me with the greatest insight into understanding the nature of this world. I covered some of this in Getting Ready (Part One), on October 2nd. Now we’ll be going into some more depth on this.